It is Nestlé-Free Week from 28 October – 4 November 2016, a time for people who boycott Nestlé over the way it pushes baby milk to do more to promote the boycott – and for those who don’t boycott to give it a go. Nestlé is the target of a boycott because it aggressively markets baby milk in ways that undermine breastfeeding and break international marketing rules. Here is a recent example from India. India has exemplary legislation implementing UN marketing requirements of baby milks and baby foods. These do not stop the products from being sold, but do stop promotion. The aim is to protect breastfeeding and ensure information on infant and young child feeding is accurate and free from commercial pressure. Nestlé tries to circumvent these restrictions by sponsoring health workers – although this too is explicitly prohibited by India’s Infant Milk Substitutes (IMS) Act. Section 9.2. No producer, supplier or distributor [of infant milk substitutes or feeding bottles or infant foods], shall offer or give any contribution or pecuniary benefit to a health worker or any association of health workers, including funding of seminar, meeting, conferences, educational course, contest, fellowship, research work or sponsorship. 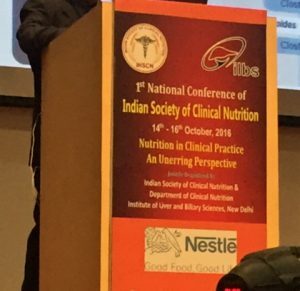 Nestlé appears to have broken these provisions through its involvement in the 1st National Conference of the Indian Society of Clinical Nutrition this month (14 – 16 October 2016), where its logo was displayed on the speakers’ lectern – see below. The Breastfeeding Promotion Network of India has exposed other examples of Nestlé targeting of health workers. In 2015, the Times of India (17 April 2015) reported on Nestle sponsoring a national quiz for nurses working in paediatric and maternity wards in institutions across the country through its front organisation, the Nestle Nutrition Institute (NNI). The government had confirmed in writing some years before that such front organisations come under the prohibitions in the law. Nestlé’s aggressive marketing practices arrived in the UK when it took over the SMA brand. A job description for Nestlé’s Clinical Representatives makes it clear their job is to secure brand endorsements. This month (October 2016) key UK health workers were invited on a three-day trip to Switzerland – including a trip to a vineyard for dinner. Nestlé promoted its SMA brand of formula at the conference of the Royal College of Paediatrics and Child Health in April 2016. The RCPCH AGM alongside the conference voted to prohibit formula companies being exhibitors. Following a consultation, the RCPCH Council has opted instead to strengthen its “due diligence” procedures. These should see Nestlé excluded in future as it is a company “in breach of required codes of conduct”. Baby Milk Action asks this approach to be kept under review. See our response. The Indian Paediatric Association long prohibited baby food company sponsorship of its events and successfully argued for provisions to be brought into law with the IMS Act. That is surely a simpler approach. ← Baby Milk Action response to RCPCH relationship with formula milk companies.